A couple of years ago, a friend asked me for advice on dressing down his normal suit-and-tie wardrobe. Like many men, he wore suits (in worsted wool) to the office, and jeans or chinos at the weekend. The office was becoming more casual, however, and he wasn’t sure how to dress down without becoming too casual and unprofessional. My first tip to him was: flannel. Most men today will have never worn flannel trousers, let alone a flannel suit. Suits for them are worsted wool – wool that has been combed and pressed, made sleek and sharp. 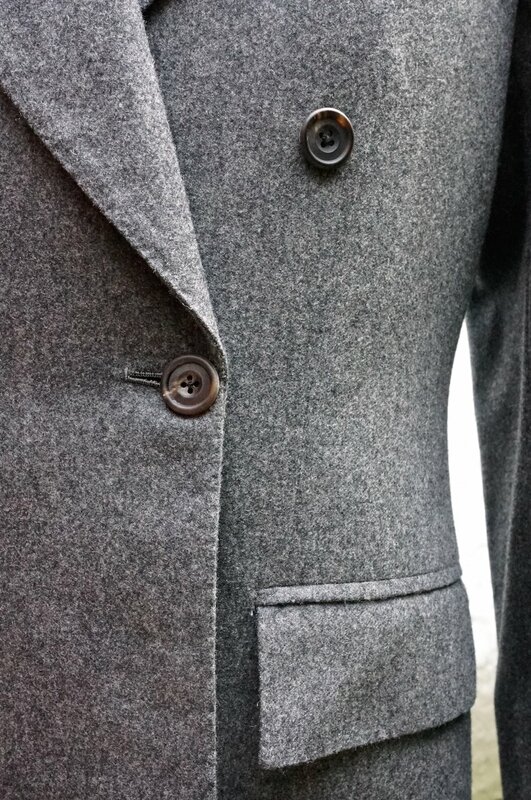 ‘Woollens’, without that treatment, are alien, yet it is they that populate much of this gap between suits and jeans. And their king is flannel. 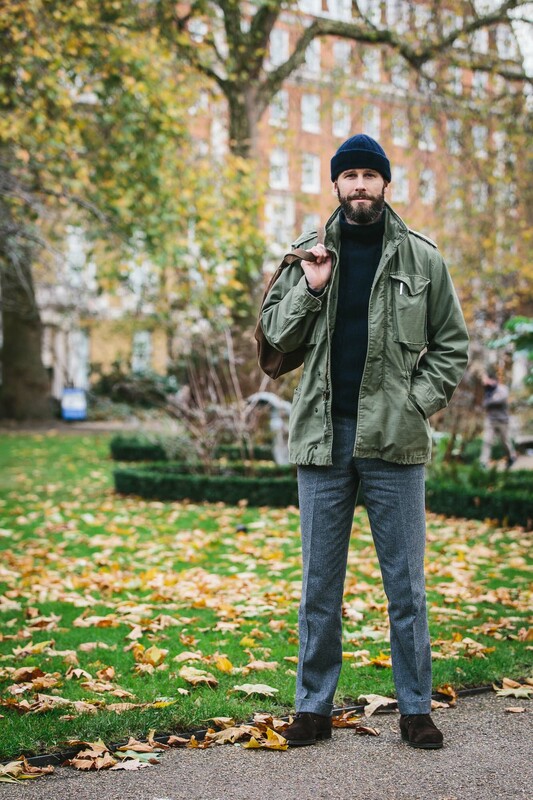 Flannel trousers – classically in grey but also in navy and other colours – are clearly smart. Yet their fuzzy (milled) texture separates them from normal suit trousers. 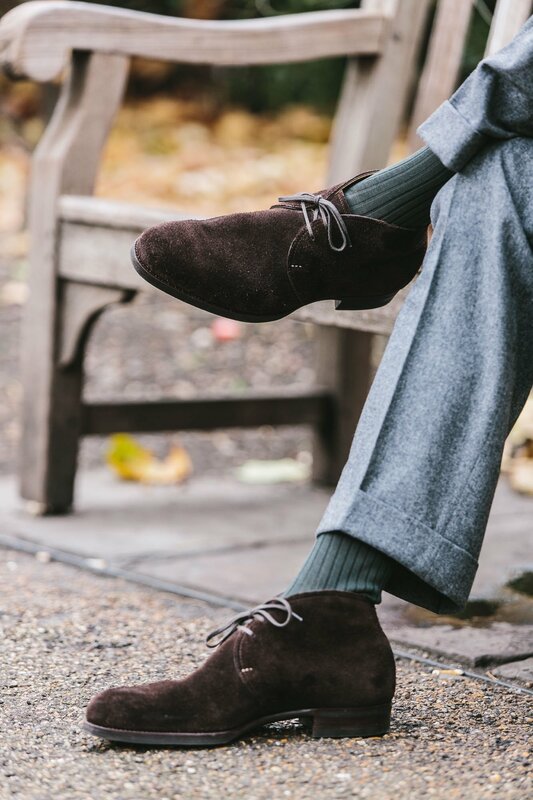 They can be worn with a sports jacket to the office – for that dress-down option – or at the weekend with knitwear, for a nice lunch or gallery visit, perhaps. They are so perfect at this in-between role that readers often ask me what the summer equivalent is – when it finally becomes too warm for flannel. Unfortunately I don’t think there is one; neither linen nor the various cottons quite fit the bill. My friend now has three pairs of flannels, in two shades of grey and one navy. And is considering a fourth. There is of course, to confuse things, both worsted and woollen flannel. Flannel can be made with worsted yarn (which uses generally longer fibres, and is then combed) or a normal woollen. What generally defines a flannel is the milling process, where the cloth is beaten about and the fibres broken, producing that fuzzy effect. A worsted flannel reacts differently to the milling and will have less texture. But to most enthusiasts of the stuff, worsted flannel is not worth bothering with. It doesn’t have most of the body and texture that is the whole appeal of flannel. Woollens as a larger group include most other things that don’t look like a classic worsted suit: tweeds, cashmere jackets, cloths for overcoats and so on. Although flannel is best defined by the milling process, it is also (like most cloths) in practice defined by its use. So a milled woollen cloth used for a coat is not normally called a flannel. Flannel most generally refers to a milled cloth (worsted or woollen) used for trousers or suits. This is actually a fairly clean and universal definition for a cloth. Others aren’t so easy. For example, ‘serge’ is used to refer to a certain type of trouser, but is strictly speaking just the weave (the name of a 2×2 twill in French). To a certain extent, recommendations as to the ‘best’ cloth also begin to merge into its definition. For example, we have said that the flannel enthusiast will insist that worsted flannel is not really flannel. For good, practical reasons around body and texture. He may then suggest that real flannel should be of a certain weight – again, with good reason. Flannels that aren’t heavy and closely set are lovely to wear, but rather impractical. They lose their crease quickly; they bag at the knees; they can even rip when wet. This often puts off the flannel novice. After a few wears, they appear shapeless and unattractive, and he is unlikely to be able to press them effectively. An argument can be made, therefore, that a flannel should really be 13oz or more – even 15oz. It is only at that point that it can be worn a few times without having to be re-pressed. In general, English flannels tend to be closer set (more yarns, denser, in the warp and weft) and use thicker yarn. As a result they tend to be heavier. Italian flannels tend the opposite way, sometimes searching for style at the expense of substance. If you have no experience and are picking a flannel, an English one is therefore a safer bet. But there are many exceptions on both sides – particularly given the Italian reverence for English cloth. Finally, grey flannels tend to be a melange of different shades (one reason they are so attractive). This melange can be achieved in different ways, in the fibre or yarn; but it’s a minor difference not worth going into here. Every technical piece must have its limits. Flannel is one of the great pleasures of classic menswear, and one that communicates readily to the novice – hence my recommendation to my friend. And while there are many different variations, I would suggest the important thing to focus on is weight. Get a 13oz flannel, 11oz at worst – particularly in trousers. Your legs don’t have as much blood flow as your upper body and don’t get hot nearly as easily. Your creases will thank you. You can follow the discussion on The Guide to Flannel by entering your email address in the box below. You will then receive an email every time a new comment is added. These will also contain a link to a page where you can stop the alerts, and remove all of your related data from the site. A very nice and simple guide for a noob like me. Thanks Simon. I‘ve come to conclusion that the summerversion of Flannel for me is grey and cream/tan crispaire. As grey Flannel they work with almost any Sportcoat. Grey Flannel in Winter and Grey Crispaire in Summer paired with all forms of sportcoats and a blue oxfordshirt became a bit of an uniform of mine. Absolutely agree. Same with me. I have 2 pairs of tan crispaire trousers and I am very happy with them. Great article! I once had a flannel suit and loved the matte look. Indeed it’s just different from all the worsted suits. Do you have recomendations? I would love a grey flannel for the office, but cannot skip the bikeride. And changing clothes in the office isn’t really an option. So basically what i’m asking is this: Is there a more hardwearing flannel out there? I find my trousers wear out quite fast due to biking regardless of being flanell, worsted, cotton or denim. Since I moved further away from the office, I don’t ride my bicycle to work anymore, but I’m always intrigued by what the dutch and the danes do about this issue, since they all seem to bike every day in normal clothes. I have a leather Brooks seat, which is more narrow in the part that sits between the legs. I then use a plastic seat cover which eliminates part of the friction. I avoid cycling in tight pants as they wear out the quickest. This is especially true for jeans which are stiffer. AJ, would it be feasible to switch out just the trousers? I cycle to work every day and wear a pair of jeans (from Rapha) for the ride. We don’t have proper changing facilities at my office, but it’s pretty easy to swap out a pair of trousers in the bathroom. I like flannel because it can be dressed down,perhaps with a fine knit roll neck sweater but I also find that a grey worsted suit with a pick and pick weave also achieves the same result with a roll neck.You could also choose a multi-colured grey cloth exemplified by Reid & Taylor or their modern equivalents.I had the latter point because R&T suiting cloth of 1970s vintage is not easy to find.What do you think Simon? I think it is very sad that Fox Brothers did their Queens Award Flannel bunch in 230g. They have a wonderful variety of colours in a weight that is virtually useless as it is too light for any possible use. For trousers 230g flannel is unsuitable. This makes it unsuitable for a suit. And for an odd jacket it is also not the best choice as it will not drape as beautifully as a heavier cloth. At the same time it would wear too hot in the summer (for example compared to a 300g fresco) as the flannel does not allow good air circulation. I really just don’t get it why they did this bunch in this useless weight. HRISTO — I had an unlined sport coat with no shoulder pads made from this fabric. Believe it or not, it is very comfortable in the summer and hangs and wears well. Even on long flights it does not wrinkle very much. I was pleasantly surprised. However, I still prefer Minnis fresco for the summer but this was a nice change up. As ever enlightening and inspiring. You asked what might be the summer equivalent of flannel. Might it be Fresco? Also a wool material with a texture that dials the formality down a notch? What about a cotton canvas, or canvas linen mix? I think this is an appropriate time to pose the question how long would a pair of flannel trousers last ? Or for that matter any item trousers, suit , jacket ? And I won’t let you use the easy get out “depends how you wear and treat them”. so lets assume a flannel suit worn 8 hours a day , twice a week for 4 months ? What I’m trying to get at is cost per wear . I think now is a time to get some quantifiable clarity. It isnt quantifiable, get a dozen pairs of trousers made in a different fabric and irrespective of if they are RTW, MTO or bespoke you’ll get a dozen different lifespans even if you wear them in the same way. I’ve had trousers made from 12-13oz fabrics that have worn out from thigh rub in 2 years and others that are still going strong after 5 years of heavy use. You’ve then other considerations like getting shiny spots, baggy knees etc which again depends on fabrics and cut etc. It also depends on the shape of your legs, your gait, and your walking habits. And sometimes whether a cloth is cut straight or on the bias. Great guide, thanks. Grey flannels in a range of tones and weights have proven very useful, especially since the temperature dropped in the UK. I have even wondered about having some jeans made up in flannel. Do you know how your friend uses the navy flannel odd trousers? I could see them being a bit less useful. Finally I would underscore your point about lightweight Italian flannels: I have had lightweight Loro Piana flannel practically dissolve under fairly modest use, and will err on the side of extra weight in the future. M i agree with you. I have a Cherquers by H&S royal blue trousers, not actually a flannel because of 1% cashmere and 1% silver mink, that is a great odd pair! It goes good with cashmere kintwear also. The 98% Super 160 ones? Do you find they are not fragile or shiny? The blue chalk stripe looks nice, but wouldn’t you expect pattern matching on the jetting? Thanks for this very instructive post! Flannel is a lovely fabric indeed! A follow up to your reply: In general, how do you estimate the importance of pattern matching at the level of the pockets? For jackets that haven’t been made bespoke, it usually seems hardly achievable, especially when alterations come into play. I do have a very nice Glen Check wool jacket, which has undergone at least two alterations over the years, but I still wear it without bothering that much with its mismatching pattern at the level of the pockets. On another note, Simon what cloth books would you recommend? As other posters have mentioned a lot of flannel bunches are in the 11-12oz range. They pitch it right in the middle I think to appeal to as many people as possible. I’ve not seen a 15oz flannel anywhere. Woollen. Always woollen. Did you read the distinction in the post? Wish this article had come out a few months ago as I just recently received delivery of a pair of flannels in 310g; sounds like I’m going to need to treat them very carefully! And yes, the lack of a flannel equivalent for the summer is a real shame. Like many men, I’ve turned to Fresco as the best alternative, but it doesn’t look quite so casual, and it’s also a bit scratchy and uncomfortable against the skin. Is Crispaire a better option? Also, I seem to recall reading somewhere that flannel used to be considered a summer fabric, which I find a bit hard to believe. Did men in the ’20s not sweat…? Yes, white/cream flannel was the classic summer trouser. They also wore three piece suits year round and never took their jackets off. I have to think they were fine because they were conditioned at such a young age or something like that. I ordered last week a flannel trouser from Marco Cerrato. Cloth was a lovely mid grey in 11 oz. Would you suggest to go for 13oz instead? I live in a Mediterranean climate so it might be too much except for 1 or 2 months a year. I’ve been looking for an alternative to denim jeans beside chinos. I came across some flannel pants in a 5 pocket style in navy that fit the bill. They appear to be jeans, but look just different enough to draw a double take. The pair I found are quite light and I’m already looking for something a little heavier. “For example, ‘serge’ is used to refer to a certain type of trouser, but is strictly speaking just the weave (the name of a 2×2 twill in French). I’ve only understood serge to mean a worsted 2×2 twill cloth, famously used in military uniforms. Can you explain more about the woollen variety and its usage as a type of trousers? The term “serge” has many different meanings – over time and in different parts of the industry. The use you’re referring to is the most historical, and is a cloth originally made of silk, a blend of wool and silk, or pure wool, having the face either singed or sheared in order to clearly show the diagonal of the weave and having quite a clean/shiny look. This definition was widely used during 2nd world war to identify the type of cloth used to make uniform for the army. Where this wool, it was worsted. More recently and more widely, it’s been more used to describe a slightly milled cloth where the milling “grade” is kept low in order to show the diagonal of the weave – this would be a woollen. Here it’s arguable that this definition really refers to the weave rather than the type of finish. Most commonly of all, serge is used today just as the French name for twill. Simon, could you recommend somewhere to get RTW flannel trousers on the lower end of the budget scale? Try Dapper Classics. They often have 25% discounts. Great trousers. I just touched a flannel from FT di Delfino today. It was so soft and silky that I thought it was 100% cashmere. It was actually pure wool but at 295g I guess I’d better not use it for a suit, maybe a jacket. 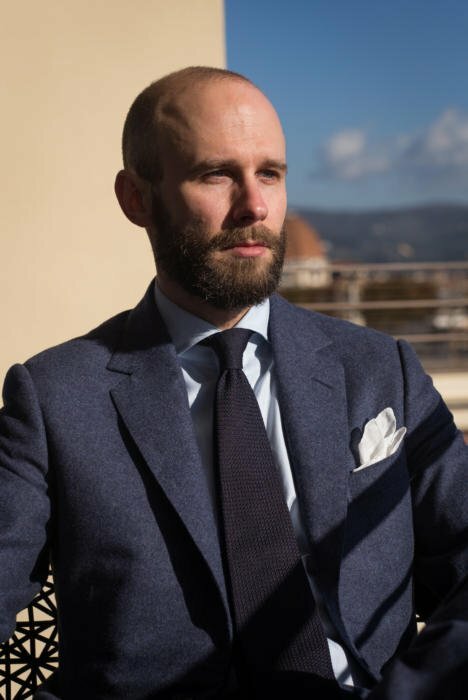 Which leads me to wonder whether many flannel bespoke suits are made: at €4000+ a suit, one expect a decent lifetime, regardless of one’s wealth. Second, I pleased to see that I am not the only one considering flannel jeans. I saw some sold by a tailor but maybe it was cotton flannel. Generally, which cloths (woolen, weight, density,..) may qualify for a jeans cut & wear? You may not like the idea, but I thought some PoW, pik&pick or dogtooth might work well. Ok. Would a slim chino cut be more suitable with such fabrics then ? If the desideratum is simply a fabric of in-between formality, there’re lots of options imo. Consider cooler fibers (e.g. silk, bamboo) spun into uneven yarns (e.g. slub) woven loosely (e.g. hopsack, basketweave) with a melange of different colors (as with flannel for suits, different shades of gray > all other color mixes). I don’t actually think the specific texture of flannel is appropriate for warmer climates. I always sweat looking at guys in brushed fabrics or with naps of any kind in the summer. My wont’s crispy in the summer and cozy in the winter. Though if you insist, linen flannel is a thing. I always have a 13oz or 15 oz flannel suit in my wardrobe. Also, on the trouser front the A&S Haberdashery have a great selection – I bought a fabulous grey pair last week to wear with an old navy cashmere/silk navy blazer that was savaged by my dog, rewoven by Zegna and is now been relaunched with new horn buttons from Bernstein & Banleys – that’s sustainable dressing for you! With regards to wear, anybody who rides a bike in flannel trousers should seek urgent help! They are for occasional wear. That said, like linen, a level of creasing is not completely the enemy and the darker the cloth, the less they show and if they are the correct weight, you wear them occasionally and you take care of them they will last. Simon, have you got details of the chalk stripe in the visual ? And will A&S have it ? No, sorry, it was made by Panico as part of the Tailoring Symposium, but I don’t have details on the cloth. Weren’t all the symposium cloths VBC, if I remember correctly? If so – could potentially be 404.598/3, 340g – or at least that would probably be the current equivalent. Sorry to post here but nto sure where else. I would like to get my first good blazer. Probably nazy, in a wool with a little bit of texture (maybe a cashmere blend??) in soft construction. I don’t want to spend more thant 6/700£. Is there any hope for me? How much is someone like Graham Browne for something like this, or Whitcomb and Shaftesbury? Would they be alright at making a soft construction? I posted a suggestion that your reader would do well to try Steed MTM as a great solution for his blazer but you must have missed it as it hasn’t appeared. Weird – don’t know what happened to that one. Consider it suggested though…. Go to suitsupply and look for a jort model. Fully canvassed and with patch pockets. Try Eidos or Sartorio if you like Neapolitan style. Good prices available on eBay. Fantastic article Simon; I’m a recent convert to flannel so this was very informative. Just thinking about some of the comments above re. cycling – I wondered if there could be a future article on cloth durability (apologies if this is contained in another article). I’d love to get your opinion and experience on which materials are the harder-wearing. I’m a primary school teacher by day, and so my clothes get a bit of a thrashing (!). I’d like to add my support for this suggested topic. Thanks! For anyone looking for heavier weight flannel cloth, try Huddersfield Fine Worsteds. I’ve had some trousers made up in their flannel and I’m over the moon! nice looking cloth….who did you use to make them up? Sartoria Vergallo. Very happy with the trousers. I’ve just bought another length to make up into trousers. Very Informative article, do you plan to write something on tweed as well? I would like to learn more on what makes it hardwearing but meanwhile why some tweeds are suitable as suit but some are not. Yes, we have it in our plan! Hi Simon – I am new the bespoke scene and I have recently spent hours reading your blog. It is amazing – thank you and keep it up! 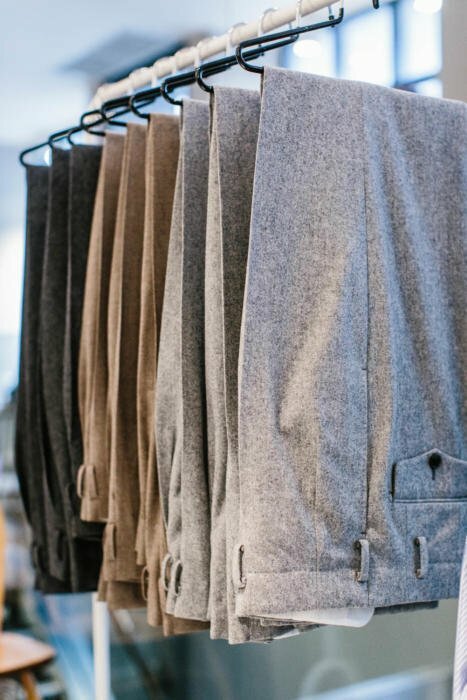 Flannel is an superb fabric – I have recently commissioned a pair of mid-grey flannel trousers (following your suggestion). I could not be happier, it is so comfortable and very versatile. I chose to go for a 12/13 oz mid-grey VBC flannel cloth. I live in a tropical country and I find it perfectly bearable. I might even consider going heavier for the next commission to get even better drape and durability. My tailor was telling me that VBC flannels are great value for money. I went through the latest Fox flannels book and their cloth definitively feels more premium (also much more expensive) – prime choice for a suit. How would you rank heavy weight (480g) Zignone flannels compared to other mills? I’m so pleased J, thank you. If anything specific was useful, do let me know – it all helps keep the site focused. I saw a worsted « fleece » wool Pow fabric at Piacenza1733. Although worsted, the PoW design was pleasantly looking blur. Any idea what a fleece wool is exactly when it comes to tailoring? I am considering purchasing a flannel suit, likely in cloth of at least 13oz, yet I am wondering during what time of the year I can wear it. I get hot easier than others on average so I’m a bit scared I won’t be able to wear it for half the year, while I really want it to be versatile. Perhaps you could give your thoughts on this? It’s hard to judge as I’d be guessing on what you would find comfortable, and what you would get used to. However, flannel is essentially a cold-weather material and you’re not going to be able to wear it all year. Part of the joy but also the cost of getting more into tailoring is that materials are not suited to every season. If you’re concerned, perhaps go for an 11oz but no less. I’m a passionate lover of heavy worsted flannels. I had recently had two suits out of two cuts of the same flannel (but two differnt taylors, for the sake of variety). Navy chalk-striped flannel from Huddersfield archives, 15,5 oz approx. A weight nowadays used for overcoats. The result is simply stunning. The texture and the shapes of the suits made of such kind of cloth are absolutely a world apart. It’s really a shame those cloths are virtually disappeared. Hi Simon I see in a VBC post that you are having a grey worsted flannel suit made. Was curious given your comments in the flannel article didn’t seem to endorse the fabric. Just wanted to double check as I value your opinion. Thanks in advance. Hi – that sounds like a typo on my part, as I’m not. Can you point me to the post? 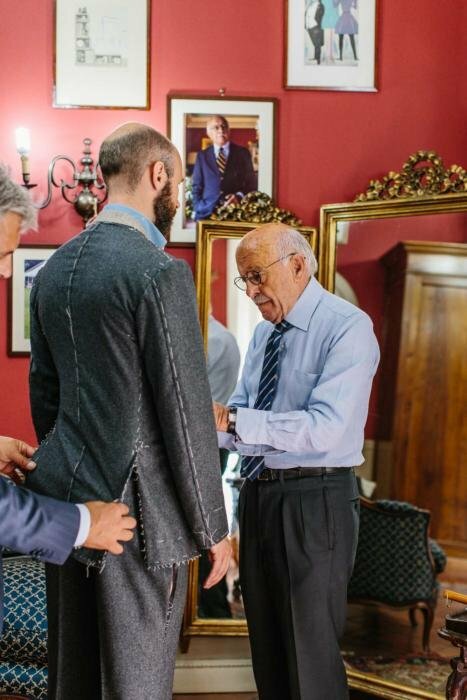 You mentioned in the section above between the photos of the hanging trousers and you getting measured for your suit that flannel enthusiasts aren’t ‘bothered with worsted flannel’. but clearly that isn’t your view. Appreciate the clarification. Hi KK. No you have it wrong – that is my view, I don’t like worsted flannel. Where did I say I was having a suit made in worsted flannel? 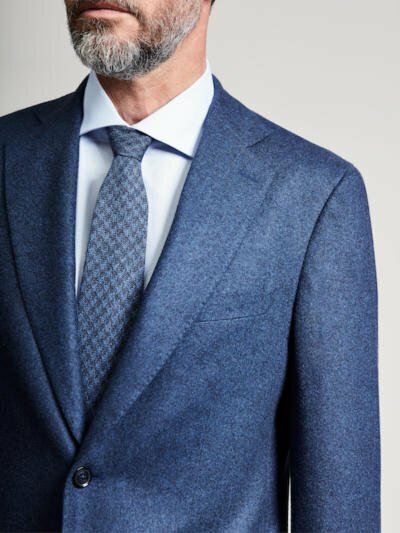 Hi Simon I just emailed you a VBC Insta photo saying that the Panico suit you were having made was in their worsted flannel….sorry for all the back and forth..FYI the suit does look beautiful. 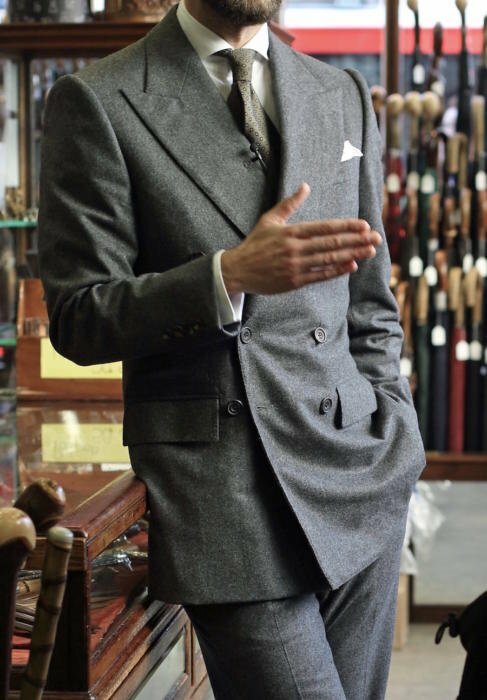 Planning on commissioning my second bespoke suit, a grey flannel, after my navy hopsack. I asked my tailor for a 13oz flannel but he has English flannel swatches in 11oz and 14.5oz. I am leaning toward 14.5oz but fear it will be too warm. In your experience is there a big difference between 13oz and 14.5oz? By the way I purchased the PS Oxford cloth and had a great shirt made by Simone Abbarchi. Great product again! Keep them coming. And great to hear on the Oxford! What is the heaviest weight flannel you’d want to make into a suit? I found a beautiful Fox Brothers flannel that’s 17/18oz that I’d like to get made into a suit for winter wear. Is that too heavy for a full suit? I really like your work and I value your opinion on men’s style. I am trying to rebuild my wardrobe and I would like my next sports coat to be a tan/beige/light brown – like our friend [attached]. I love how flannel feels but I am not sure if flannel is the right fabric for a sport coat [compared to tweed]. I live in a temperate climate so I can wear flannel at least 2/3rd of the year. • What do you think of a 270gm Tan flannel fabric for a sport coat? 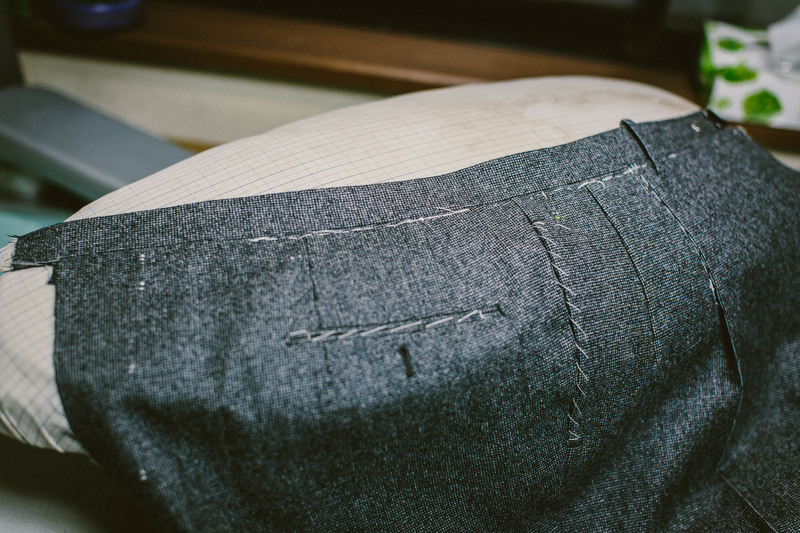 One of my commissions for this year will be a pair of bespoke flannel trousers, to be worn on weekends. My favorite fabric is a lovely mid grey, with a 300 gr weight. Is it too light or delicate? I find that my flannel trousers always catch my over-the-calf socks, and thus making my trousers look very short when I stand up. For that reason I have to wear mid-calf socks with flannel trousers. Is there any solution so that I can wear flannel trousers and OTC socks together without looking silly with short trousers? you wrote a superb article! I’ve recently chosen a cloth for my new (first) bespoke suit (mainly for business purposes) and it is a navy worsted flannel from Scabal. Dark blue colour (close to the third picture in your article), slightly glossy and with the nap. At about 10,5 oz which should be great for all seasons except summer. As I read the article and comments, you are not a friend of worsted flannel. I do understand the arguments and agree that woollen flannel is even more appealing. But I wonder if it is some kind of “rule” among bespoke suits connoisseurs (not just flannel enthusiasts) that worsted flannel should be avoided (as perhaps something that tries to bridge both categories but fails in their eyes) or a personal preference? 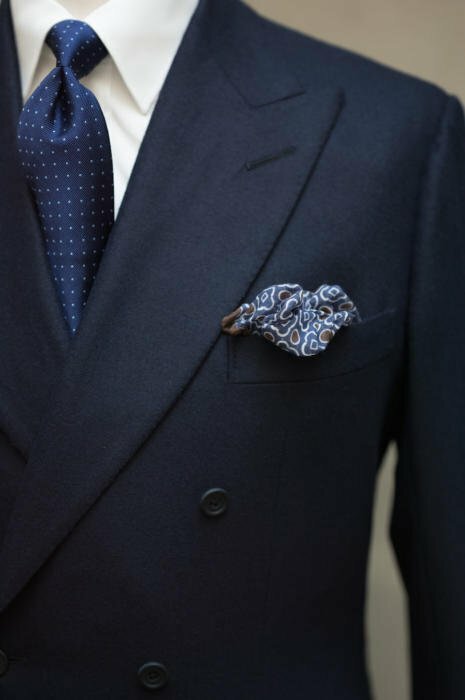 I have to say that I like the fact, that worsted flannel is more durable (like worsted wool, I hope) and also have at least some amount of the nap which I want to have on my suit (I consider the “fuzzy (milled) texture” of flannel much more appealing than that of plain worsted wool without the nap). It’s seems to me a great compromise. But since I have no substantial experience and I want to make a smart investment with my first suit, I’d like to ask you (with your knowledge of taste and tradition) if I should reconsider my choice of cloth. Hi John. You’re right, these kinds of things can become ‘rules’ too easily. The important thing is to understand why so many people think it is the right thing to do, and then work out whether you care about those reasons or not. So with worsted flannel, the reason people dislike it is that it doesn’t really have the same nap surface or spongey feel of normal flannel. And people go for worsted flannel because they want a lighter weight of flannel, when actually everyone could wear heavier weights if they wanted. So, nothing wrong with your choice, but consider whether you care about those reasons or not. Personally, I’d recommend going for true flannel first, but that’s just me. I see – so Pecora Nera would be an exception to the rule? It is doubly attractive to me as I am very hard wearing on my clothes making cashmere an unpractical luxury leaving just tweed for me in the fall and winter. You’re right even the “plain” options in PC have some type of texture or pattern like twill. Thanks! I am planning to commission a casual jacket. What are your thoughts on blue flannel blouson with stand up collar and blue flannel shawl collar (like the one from Anderson Sheppard)? Hi. A blouson with a shawl collar? Or are those two different jackets you’re talking about? Thank you for the reply. Those are two different jackets. Just would like to hear your thoughts these two different style (make up with blue flannel) Thank you! Ah, I see. For the blouson,personally I’d use cashmere, not flannel. And a dark blue, a navy. On the jacket, that would be very nice but quite a showy, unusual jacket. That is very helpful. Do you think the shawl collar would be a bit too formal for casual wear? Also, would you suggest light grey over navy for the two jackets? Thank you once again. Yes, I think it would be too formal – redolent of evening wear like a velvet jacket or tuxedo. No, I’d say navy would be better than light grey in general. It would likely be more versatile. Would it still be too formal if I go for a shawl collar cardigan with style details like the one from Anderson and Sheppard but in flannel? I was thinking a cardigan, even with a shawl collar, is on the casual side and pair well with jeans etc. Thanks. Yes, a cardigan would be more casual. But in that case I wouldn’t use a tailoring material like flannel. Use knitted wool or cashmere. Flavour is a luxury cloth collection to savour; something that goes beyond mere style to stimulate the senses through texture and touch. 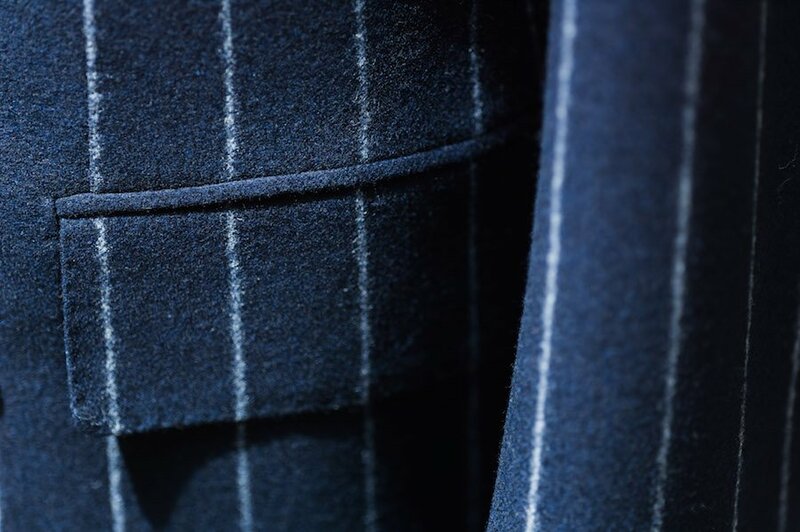 Fashioned from 100 per cent pure cashmere flannel, the range spans a rich palette of plain shades perfect for bold blazers, sophisticated suitings and luxury trousers. Its autumnal hues – forest greens, deep burgundys, frosty blues and myriad greys – make for sturdy statement wear throughout cold-weather months. A collection for gentlemen of taste.